Here’s a great, simple tool for tuning and visualising WIP (Work In Progress) on your team. 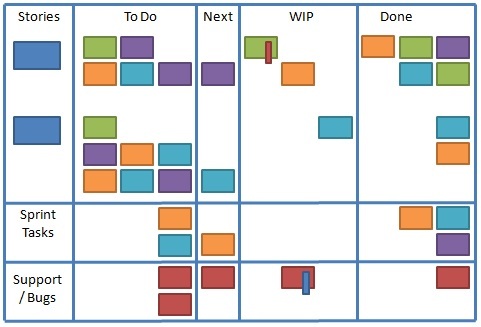 Add a “Next” column between “Todo” and “In Progress” on your Scrum / Kanban board. Team members only pull items into “In progress” from the “Next” column – and only when they actually start work on it, not when they plan to work on it. Keep the “Next” column itself deliberately only wide enough for 1 task and replenish this with team input on priority/necessity when the “Next” column is empty. This simple clarification has a huge impact on knowing who’s really doing what, when something has actually started and what we intend to do next. For one of my teams I’m working with at the moment, this small tweak has had a knock-on impact of dramatically reducing the number of items in the WIP column to at most 1 per person (many tasks are covered through collaboration), per type of work (new features, debt/cleanup & support). The team now use the full width (3 tasks wide) of the WIP column to indicate coarsely how “done” an individual task is (rather than filling the width of the column with potentially active tasks) which in turn has given us all much greater visual clarity on whether we’re actually going to reach our next goal – even when sat 10-15 feet from the board! It’s really rewarding to see a team that instinctively “get” the value and benefit of simple visual management. Give this a try with your teams and see how it works out. I’m pretty sure next sprint we’ll only be pulling 1 story onto the board at a time – I’ll post about this in future. This entry was posted in Project Management, Simple Tools by The Captain. Bookmark the permalink.